Good to Go is a fun online video slot game from Microgaming that has been released in November 1999. This online video slot machine game has 5 reels and 9 pay lines. The theme of Good to Go is inspired by the excitement and adrenaline rush you get while watching a good, clean Formula 1 race. As the five red lights illuminate, and as they go out, it will be the start of this exciting new high octane slot game from Microgaming. The theme coming from open-wheeled racing cars ensures that this video slot game is fast paced and exciting, with entertaining game play and lots of prizes to win! Microgaming online slot games are available to players in 2 formats – download and no-download. Whether you like to download their software first or you prefer to play instantly without the need to download, then Microgaming surely has slot games to cater to all of your slot gaming preferences. Since Good to Go is available for instant play, you can easily find out if you like this game enough to spend money in it. Are you ready for the fastest race you’ve ever witnessed in your entire life and get to win some money while you’re at it? Then Good to Go is the one for you as this online slot game features scatter wins, a Wild substitute, a maximum coin jackpot of 5,000, and a maximum cash jackpot of $50,000! 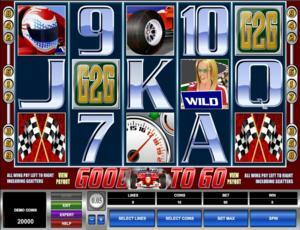 The quality of the graphics and sound provided by Microgaming software is definitely superb. They possess an impeccable track record of creating the most high-impact graphics and realistic sound effects. Most people love Microgaming because its online slot games have smooth animation and engaging yet non-intrusive sounds. In Good to Go, they have really done a great job of incorporating a video slot game together with an adrenaline-pumping F1 race theme. The symbols are drawn in a realistic manner, and even if they are brightly colored, you will still love to play for a long time as it does not strain your eyes. The symbols have simple animated programming once you have formed winning combinations with them. The overall graphic design of Good to Go displays a chrome and dark blue color scheme with 3 sets of line indicators on each side, which actually resembles a lot like the starting lights of an F1 lineup grid. The colors used in the game are red, green, blue, yellow, chrome, black and white. The constant background sound effects you will hear in this game will make you think that you are at the actual racetrack, with the buzzing of engines and high-pitched squealing of the tires when they grip the tarmac. When you form winning combinations, you will hear short celebratory no-nonsense sound effects that match the game’s theme. When you are paid scatter wins, you will hear a special rev. The card deck symbols available in the Good to Go online video slot game are 7, 8, 9, 10, J, Q, K, and Ace. The regular symbols that you will find in Good to Go are the Race Car, Good to Go Logo, Racing Helmet, Racing Wheel, and the Checkered Flags. The Wild Symbol is the Pit Girl. The Pit Girl acts as a substitute for all other symbols (except for the Scatter symbol) in order to help you form a winning combination. You are paid certain prize amounts (refer to the Payout table) when you manage to form a winning combination with multiple Pit Girl wild symbols on an enabled pay line. The Scatter Symbol is the Speedometer. Scatter symbols mean that they do not need to appear in a line (on an enabled pay line) for you to win. The Speedometer scatter symbol can be found scattered anywhere on the 5 reels, and you are able to form winning combinations as long as there are 2 or more Speedometer scatter symbols that come out in consecutive order (left to right). Your winnings are calculated by multiplying the Speedometer scatter symbol combination payout (refer to the Payout table) by the total number of coins you’ve bet. If you manage to get 2 or more Speedometer scatter symbols in consecutive order, you will trigger the Free Spin Bonus Feature game. Please take note that if you get a scatter win and a regular, then you are paid out for both of these wins, because the Speedometer scatter symbol is not required to come out on an enabled pay line for you to win. The scatter win is included to the pay line win. Please take note that if you get any winning combination, you can choose to gamble it in the Gamble Feature game, or you can just continue playing the regular Good to Go online video slot machine game. Your wins will be multiplied by 2x if you correctly guess the card color. If you want to play the Gamble Feature game, simply click on the Gamble button. The second-screen Gamble Feature will be shown. You simply choose a card color that may come out next: black or red. If you guessed correctly, you have the option to collect your winnings or gamble again. If you click the Collect button to collect your winnings, the Gamble Feature game will end, and you will be returned back to the regular Good to Go online video slot game. Please take note that you can gamble your winnings until the gamble limit is obtained; during the Gamble Feature game, all winnings are collected automatically; and the gamble limit is set at 5 gambles per game, or up until the gamble amount limit of 8,000 coins is obtained. Free Spin Bonus Feature Game – If you manage to get 2 or more Speedometer scatter symbols found anywhere on the 5 reels, in consecutive order, you will trigger the Free Spin Bonus Feature game. Please note that while playing the Free Spin Bonus Feature game, scatter wins can come out in any position on the reels. You will be given 3 Free Spins. The Speedometer scatter symbols that triggered the Free Spin Bonus Feature game are held. Any Speedometer scatter symbols that come out on the reels during a Free Spin will also be held, and the Free Spin counter will be reset back to 3 Free Spins. The Speedometer scatter symbols that are held in place will start to accumulate up until the end of the Free Spin Bonus Feature game. If there are 5 Speedometer scatter symbols held at the end of the Free Spin Bonus Feature game, your maximum scatter win prize is repeated 3x! Once the Free Spin Bonus Feature game is over, you will be then taken back to the main Good to Go online slot game, and your winnings from the Free Spin games will be included to your overall balance. Good to Go has 5 reels where you may bet on 9 pay lines. The minimum bet is 0.01 and the maximum bet is 2.00 per pay line. You can wager from 1 up to 10 coins per pay line bet. Therefore, the maximum bet amount is 180.00 per spin. Please take note that the amounts mentioned are in Pounds, but they will remain the same if you choose to play in US dollars, Euros, or Canadian dollars. Also, for every coin that you wager, you will enable another pay line. You will be paid out for winning combinations on enabled pay lines only. The maximum payout in the standard Good to Go online video slot game is 5,000 coins per line bet. People who regularly play online casino games naturally love to stay longer on online slot games that have an Autoplay function. Good thing that Good to Go is furnished with this function! In Microgaming online slot games, they have 2 game modes – Regular mode and Expert mode. You can have the game spin automatically for you with the Autoplay function that can be found by clicking the Expert button (if you look closely at the brown line at the bottom part of the game screen, you will see the Expert button just below the Bet Max button). After customizing the Autoplay function to your preferences, just click on the Start button, and the game will automatically spin for you while you just sit back, relax, and enjoy playing this Formula 1-themed online video slot game!